is a nearly all metal mower. It is powered with 10′ wheels and cuts from 1.5″ to 3.5″. The 10″ wheels add torque to the blades. It has rear wheels which makes the Classic maneuver well in high grass. The Classic has six fixed cutting height settings. The reel blades are 16″ wide. The Easun NaturCut Ideal 40: The Easun NaturCut Ideal 40 is powered by 10″ wheels and cuts from .6″ to 2.75″. The 10″ wheels add torque to the blades. It has the traditional rear roller bar which helps stripe the grass. The Ideal fully adjusts from .6″ to 2.75″. The reel blades are 16″ wide. The Difference: So the difference between the two mowers is the height which the mowers cut. And the Classic has the rear wheels, the Ideal has the rear roller. Lastly nearly all of the components on the Classic are metal, and the Classic weighs a few pounds more than the Ideal. For folks who want to cut their grass high, there is the Classic. For folks who want to cut their grass short, there is the Ideal. 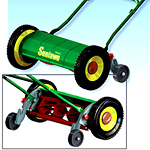 Both mowers have the option of a Grass Catcher. Composting history: We have been selling compost makers for many years. First there were composters made for one family. These were tumbling machines, turning machines, gravitational machines, and batch machines. All handled the amount of waste which one family produced. 2nd Generation: The next phase of compost makers seemed to focus on industrial needs such as schools, businesses, hospitals, etc. These composting machines were very large and very expensive. Small units cost in the $20,000 range and large ones in the $80,000 range. 3rd Generation: Now we see a new focus. This effort targets an in between group, let’s say a 10 family to 15 family output. Or you could say it would service the output of four or five classrooms. We have just made an agreement with a company which is marketing the Biolan 220 and the Biolan 550. Produced in Finland these composting units are new to the US. We will have the 220 and 550 on our site in the next few days. We are excited to add these composting machines as they allow us to enter a new market. The Biolan 550 easily handles 5 gallons of waste per day. It takes 6 weeks to begin producing compost. These composters are excellent in cold climates. Annual Maintenance: Each spring you should check the condition of your reel mower. If it has not been cleaned with WD-40 since your last use you should clean it. Spray the blades with WD-40 and wipe clean. Remove any dirt and grass clippings from bed-knife. Remove dirt from the wheels. Safety Check: Check all the nuts and bolts on the machine. Tighten all so that connections are secure. Make sure handles are secure. If you have a Brill, NaturCut, or Fiskars Momentum, you’ll need to adjust the blades. 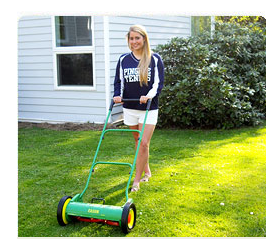 Blade Adjustment: Check the manual for your mower on how to adjust the blades. With the Brill and NaturCut mowers you were sent a gauge. The Fiskars adjusts without a gauge. Adjustment should be done each spring. Keep the gauge in a safe place. Here are 2 new videos of the Brill RazorCut reel mowers in action. One will show you how easy it is and the other will show you the mower cutting in longer grass. You may want to compare these to the Fiskars reel mower Videos we posted earlier this week. Here are ten toxic products, in no particular order, that you don’t need. And, once you read about them, you probably won’t want them either. Be aware that different homes may have different products that are more toxic than these. This is just a basic list of some of the most commonly purchased products that are almost entirely unnecessary, but pose significant risks. Read the whole really great article here. 1. Air fresheners: Most air fresheners numb your sense of smell with chemical anesthetics. 2. Drain, oven and toilet bowl cleaners: Yes, three products instead of one, but they all fit under the category of cleaners – and these are the three nastiest. 3. Canned food: Food cans are lined with an epoxy resin that contains bisphenol-A (BPA). Eden Foods is currently the only company with BPA-free canned foods (other than the canned tomatoes, which they haven’t found an adequate substitute for given the acidity of the tomatoes). 4. Pesticides: Kill things. There are so many non-toxic ways to eliminate pests and weeds – next time you need to get on the offense, check out the recommendations at Beyond Pesticides. 6. Bottled water: From manufacture to disposal, bottled water creates an enormous amount of pollution – making our water even less drinkable. 7. Rubber duckies: made from PVC – the poison plastic. Banned in over 14 countries and the European Union, PVC, also known as vinyl, is still legally sold by U.S. retailers although it threatens environmental and consumer health at every stage of its product life cycle. 8. Couch cushions: anything with foam labeled as meeting California TB 117, as it is likely to contain toxic fire retardants. These chemicals migrate from the foam to dust to people. In animal research, these chemicals are associated with cancer, birth defects, thyroid disruption, reproductive and neurological disorders such as hyperactivity and mental retardation. 9. Perfume and cologne: Contain phthalates – suspected carcinogens and hormone disruptors that are increasingly being linked to reproductive disorders. Rarely listed on product ingredient labels. Find out if products you currently use contain phthalates and find safer ones on Environmental Working Group’s Skin Deep Searchable Product Guide website. 10. Oil-based paints and finishes: There are 300 toxic chemicals and 150 carcinogens potentially present in oil-based paint, according to a John Hopkins University study. We have a page on our site called “Why buy from PPM” which I keep meaning to update. With all the web competition out there, and just having returned all energized from the green-expo, I just wanted to emphasize there is a difference when buying from a large many-products drop-ship model of online store and a web store like ppm- where products are tested, selected, and enthusiastically supported. As of 2010, we have over 13 years in this business and are approaching 60,000 mowers sold. We have been around since Netscape 2.0 and have sold reel mowers way before environmental concerns were fashionable. Our commitment is not newly fashioned. Our expertise is hard-earned. And our mission is unquestionable. We are known for our great customer service, quick shipping, and expertise in areas such as school composting curriculums, solar installations, and industrial composting. But one of the major reasons to buy from Peoplepoweredmachines.com is we are real people. We will pick up the phone and answer your product questions, AND we have worked hard to select just a few products we believe in…not just selling everything that comes our way. So when your reel mower makes that funny noise, we can help. When that little part breaks, we can help. When your dog eats your manual, or replacement parts, we can or at least try to help (or suggest a pet poo composter!). All the best, and happy spring! Today is World Water Day and of all the articles I read, it was the simple numbers of our daily food choices that grabbed me. Of particular note, my favorite foods from butter, olives, chocolate and wine are all water-wasting choices. Darn. And isn’t it surprising that lettuce is low on the list? I thought that would take more water to keep hydrated. Go figure. Note: In general these figures have been derived from work done by Waterfootprint.org and represent gallons of water consumed per pound of food (except for beverages, whose volumes are listed). They represent global averages, not specific conditions in any one place.